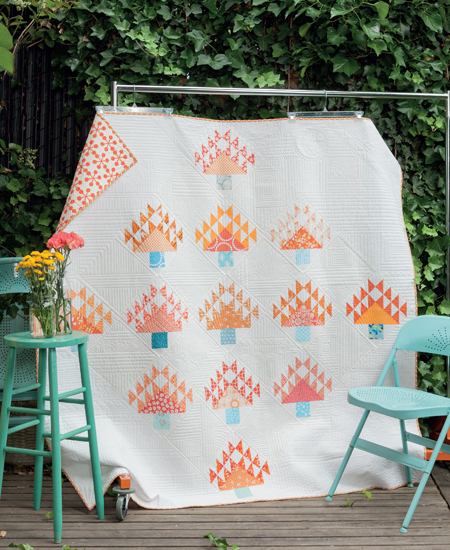 If sewing with friends sparks your creative passion, jump-start your next retreat or sew-in with the projects in this well-curated collection. Organize your sewing tools and supplies with nine make-ahead projects; then choose from seven more projects to stitch for fun, alongside your friends. 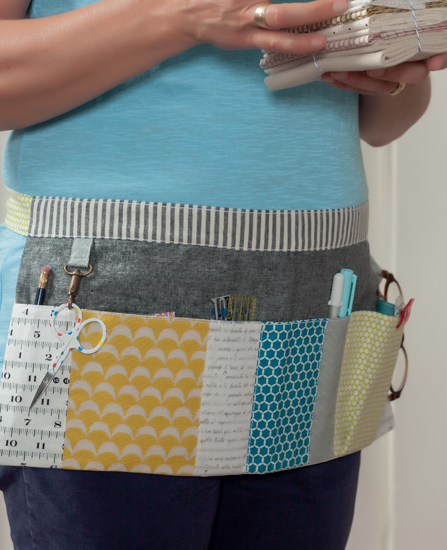 Twelve expert designers share their inspiring ideas for sewists on the go. The book begins with an introduction by the author. In reading it, I want to attend one of her retreats! Sewing by the ocean, a six-foot long table to work on, food prepared by someone else and many more things. Heaven! 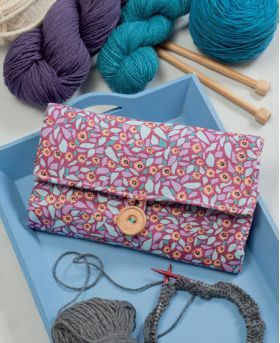 The book has 16 projects to sew. 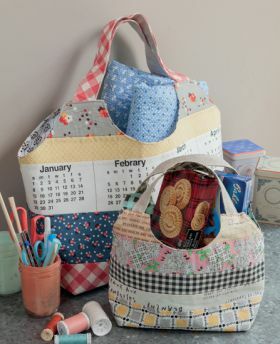 Whether you make them with friends or sew them in your own sewing room, you will find wonderful projects. The book is divided into two sections: take your sewing on the road and sewing when you get there. 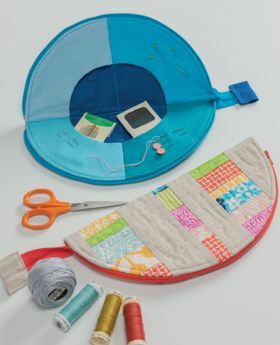 The first section are projects so you can take your sewing supplies safely and easily to whatever retreat or sewing circle you are attending. They include totes, thread catchers, scissor keepers, sewing mats and even an apron. The second section is full of projects that range from quilts to placemats to table runners and a pillow. There are color photos of the projects and each has a paragraph about it. Cutting and material lists are easy to understand and there are enough graphics interspersed in the written instructions to help you make sure you are on the right path. Any templates needed are included at full size. There are several pages from other authors who contributed to this book on sewing and their viewpoints and suggestions. One of the quilt patterns is a Lone Star. I have been wanting to make one but dreaded the inset seams. With this pattern there are no inset seams. The authors even tell you what they used to finish quilting for all the quilts. This is a wonderful book. Whether you make these items by yourself or use it as a retreat project book, you won’t be disappointed. "I received this e-book free in exchange for providing an unbiased review." The projects in this book present a plethora of ideas for yourself and quilting friends to make your quilting more enjoyable and organized. No matter how organized you space is there is always something that helps to make the process easier. Nothing complicated and can make in one to two days. Grab some friends and make gifts for everyone on your list. I recommend this book for anyone that sews, crafts,knits, crochets, hooks, counted crosshatch, and/or quilts. 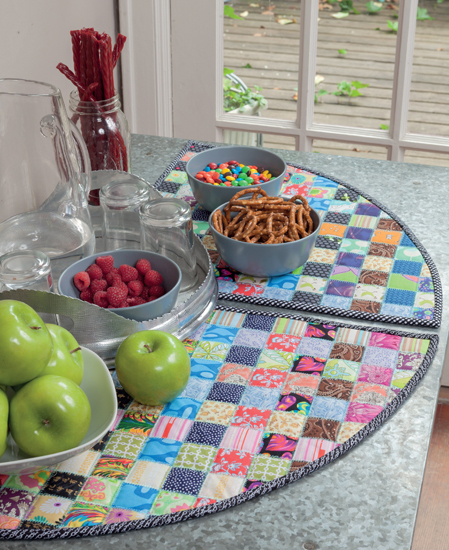 Currently, more and more quilters are daring to travel in order to gather to sew with friends. One way to rejuvenate is sewing with friends either for a few hours, a full day or a weekend getaway and devote time to sew. I confirm again and again that free the mind from the everyday, a mental space is created to develop new ideas to be stored while we are dedicated to complete a project and share conversation and sewing tips with our friends. 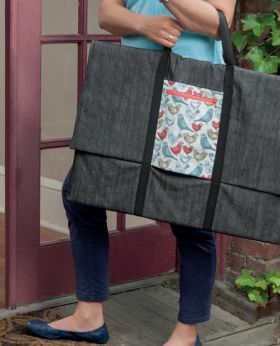 The first nine projects are designed precisely to facilitate the transfer of materials and simplify your order when you get to your destination, from a bag ideal for carrying a cutting mat and the respective rulers, to a very useful and charming apron to put our tools and keep them always at hand. The following seven projects are planned to be worked precisely in meeting with friends. There is for example a cushion made with the technique of paper piecing precisely intended to finish in one sitting. Others include plan ahead as the project of a simple blanket made of six friends, using the technique of Log Cabin and combining pre-cut strips of fabric at home. At the meeting the six said pieces of fabric are exchanged so that everyone takes home a complete work and the memory of a delicious day together. 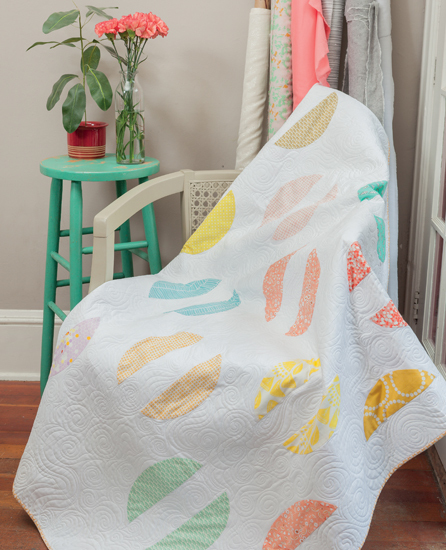 Three of the quilts require a little more time and are designed to complete the top on a getaway weekend sewing. The publication includes boxes with tips and advice that facilitate cutting or assembly for example. An idea that seems sensational to include this type of meeting is first requiring participants to bring with specific colored fabrics, thus making a block. The purpose of this activity is that a drawing is made and winning the blocks produced by all members takes to end the "weekend getaway." The quilt in the book called Orange Grove Quilt (The Orangery) is a perfect project and includes the suggestion of the author. In addition to fresh and new projects, each of the designers presents us tips and ideas along with comments and personal anecdotes. Either one day or a weekend, sewing, friends and co-existence in general full of energy and increases the desire to meet again to exchange ideas, learn new techniques, storytelling, and especially sewing company. One of quilting's greatest strengths as a hobby can also be a great weakness for those of us who love socialising; it can be, by its very nature, a very solitary pursuit. Quilting groups and retreats are more popular than ever, however, and this encouraging trend is often overlooked by many publications. We're hard pressed to recall more than three books we've recently reviewed that really cater for the social aspect of our craft. 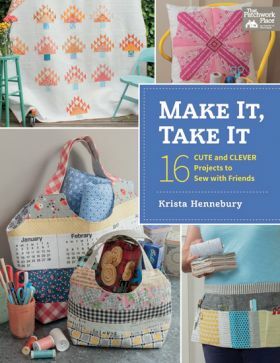 However, Make It, Take It addresses quilting with friends admirably, presenting sixteen projects designed to be useful for quilting get-togethers. 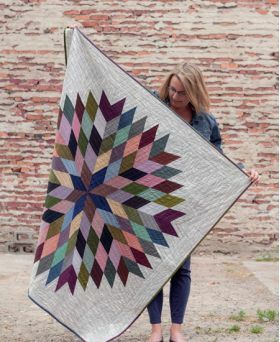 From the oversize tote bag, to smaller but no less useful items such as the scissors holder and crafter's apron, there are enough non-quilt projects in here to keep things varied and interesting, and the quilts themselves are gorgeous, particularly Lynne Goldsworthy's "Lone Star Circle Quilt". The book's contributors stress how wonderful it is to quilt in like-minded company, and we thoroughly agree. A terrific book, well worth poring over with some friends and a cuppa! Krista Hennebury was so taken with her first quilting retreat - sewing, learning, relaxing, more sewing and eating food prepared by someone else - that she has been to over 50 of them and has now been running her own retreats for the last 10 years. Wonderful days away from family and work commitments are a great way to relax and really get some sewing done in an atmosphere of friendship and fun. The 16 projects in this book are planned with retreats in mind, either for work to do while there or for things to take and use. 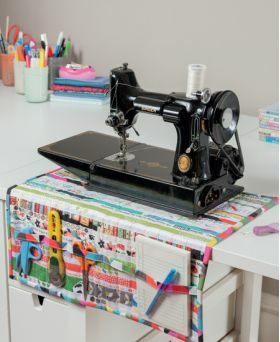 An equipment tote, needle clutch, pillow, apron with pockets for equipment, thread catcher - from the entirely practical to full quilts, table runner and placemats - you'll find a use for them all. Krista assures us that her project-specific tips and tricks enable sewists (isn't that a better word than '"sewers"?) of any level will be able to make any of these lovely items. If you are thinking of a retreat, this book will provide all the inspiration you'll need. 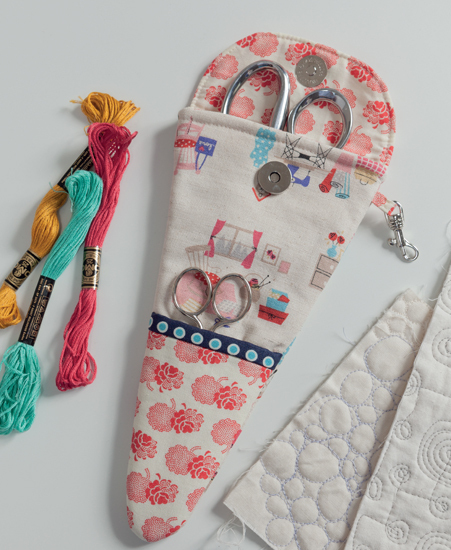 Get instructions for nine projects that'll help you organize your sewing tools and supplies and for seven projects to create at a quilting retreat in Make It, Take It. 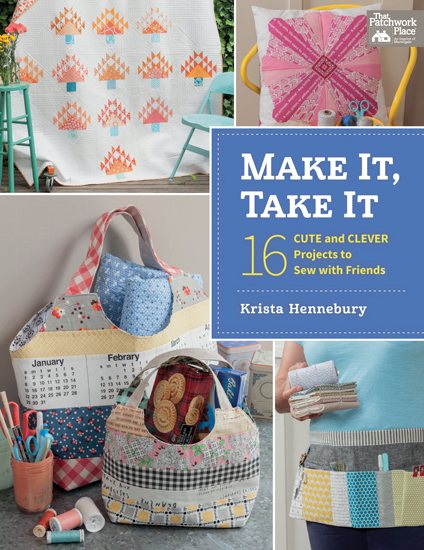 Day retreat host and author Krista Hennebury culled projects and tips from 12 designers to help you make the most of your retreat or sew-in. More and more quilters and sewists are embracing the idea of sewing in groups. 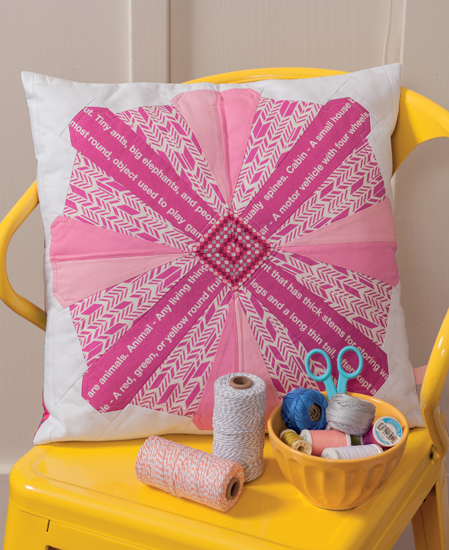 Camps, retreats and sewing parties are a great way to socialize while getting your crafty fix. 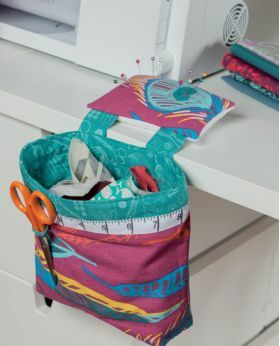 In Make It, Take It, you'll find instructions and illustrations to create cute and clever projects that help you get organized and take your sewing on the go, such as an equipment tote, scissor keeper. thread catcher and more. 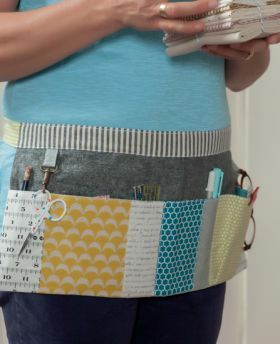 Plus, find fun projects to sew with your friends once you get where you're going. 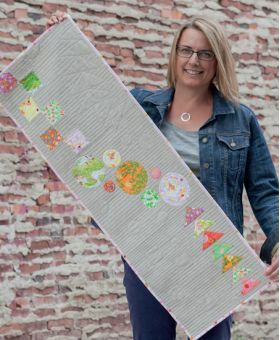 Krista Hennebury dabbled in crafty sewing projects since elementary school. 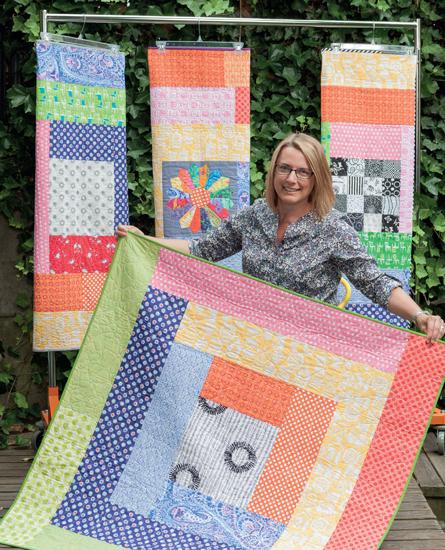 In 2000, she took a beginner quilting class at a local quilt shop and instantly knew she had found her passion. Now, after years of taking workshops, teaching workshops, actively participating in both traditional and modern quilt guilds, and running a successful day-retreat business, Krista is thrilled to be a part of the exciting online blogging community. She makes traditionally informed modern-style quilts and a lot of bags. All of this magic happens in her small sewing-room-with-a-view near Vancouver, Canada, or on retreat with her sewing friends. Connect with Krista at her blog, Poppyprint.